This painting depicts the moment on June 28, 1776, when the first draft of the Declaration of Independence was presented to the Second Continental Congress. The document stated the principles for which the Revolutionary War was being fought and which remain fundamental to the nation. Less than a week later, on July 4, 1776, the Declaration was officially adopted, it was later signed on August 2, 1776. In the central group in the painting, Thomas Jefferson, the principal author of the Declaration, is shown placing the document before John Hancock, president of the Congress. With him stand the other members of the committee that created the draft: John Adams, Roger Sherman, Robert Livingston and Benjamin Franklin. 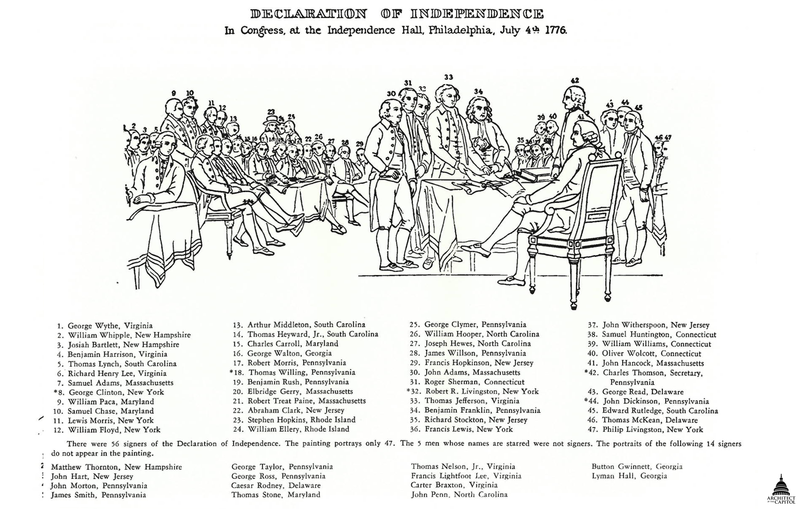 This event occurred in the Pennsylvania State House, now Independence Hall, in Philadelphia. When Trumbull was planning the smaller painting in 1786, he decided not to attempt a wholly accurate rendering of the scene; rather, he made his goal the preservation of the images of the Nation’s founders. He excluded those for whom no authoritative image could be found or created, and he included delegates who were not in attendance at the time of the event. In all, 47 individuals (42 of the 56 signers and 5 other patriots) are depicted, all painted from life or life portraits. Some of the room’s architectural features (e.g., the number and placement of doors and windows) differ from historical fact, having been based on an inaccurate sketch that Thomas Jefferson produced from memory in Paris. Trumbull also painted more elegant furniture, covered the windows with heavy draperies rather than venetian blinds, and decorated the room’s rear wall with captured British military flags, believing that such trophies were probably displayed there. The exhibition of this small painting (now owned by the Yale University art gallery) was instrumental in securing for the 61-year-old artist a commission to create monumental paintings for the U.S. Capitol. Trumbull created the enlarged painting for the Rotunda between August 1817 and September 1818. On October 5, 1818, the painting was put on public view at the American Academy of Fine Arts in New York. Over the next four months, he exhibited it in New York City, Boston, Philadelphia, and Baltimore; it was in the Capitol early in 1819 and was displayed or stored in various rooms until 1826, when it and Trumbull’s other three paintings were installed in the Rotunda. Declaration of Independence balances the last of Trumbull’s Rotunda paintings, General George Washington Resigning His Commission. The two paintings are similar in composition, with figures seated and standing in the background. The central action in each is the presentation of papers: here, by Thomas Jefferson; in Washington Resigning, by George Washington. Both scenes take place in the chambers of a civilian legislature, and Trumbull’s use of similar chairs in the two paintings subtly reinforces their relationship. Trumbull performed the first cleaning and restoration of his Rotunda paintings in 1828, applying wax to their backs to protect them from dampness and cleaning and re-varnishing their surfaces. Throughout the 19th and 20th centuries the painting was cleaned, restored, varnished, and relined. All of the Rotunda paintings were most recently cleaned in 2008. An 1820 engraving of Declaration of Independence by Asher B. Durand, who would later become a renowned landscape painter, helped to make it Trumbull’s most famous painting. It is pictured on the reverse of the two-dollar bill and has appeared on U. S. postage stamps: a 24-cent stamp in the series of 1869 and two sets of bicentennial stamps in 1976 (a sheet of five 18-cent stamps and a strip of four 13-cent stamps).